The iconic UCCS clocktower is updating its playlist and receiving a state-of-the-art high-tech upgrade in April. Beginning April 1, three popular songs will be carefully arranged to fit the tower’s new 23-bell format. Fan favorites “Enter Sandman” by Metallica, “Man’s Not Hot” by Big Shaq the theme song to “Curb Your Enthusiasm” will now greet students as they traverse from class to class in El Pomar Center. 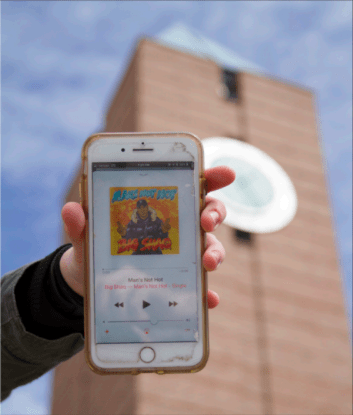 UCCS’ famous clock tower has played three songs since the school’s opening, including the CU Alma Mater, John Cage’s “4’33’” and “God Bless America.” However, due to high demand, these songs will be replaced, according to Wary Jillson, executive director of music for the clock tower. According to Jillson, the new songs will be played through an advanced technology to better reach all students: Bluetooth connectivity. While Jillson has implemented the new songs, students also have the ability to queue up whatever they want to play through the bells on Bluetooth as well. This will be accomplished by listening in to the microphones on every cell phone on the Spine at any given time. Students will be able to pay a one-time fee, equivalent to the dollar amount of parking pass that they possess, to be able to play whatever song they want through carillon as they walk past it. “It helps students to be able to set the mood for whatever high-traffic time they want,” said Jillson. The first student to use the Bluetooth feature was Chad Brockton, who played “Wonderwall” by Oasis. Some students on campus say that the song was completely unprompted and killed the mood of the walk to their next class in Osborne Hall. The 15 gargoyles that reside within the tower will be responsible for playing the “Curb Your Enthusiasm” theme song. The comedic piece will be played whenever someone on the Pedestrian Spine is tricked or placed into an inherently hilarious situation. Plans for completely disrupting the time-keeping function of the clock tower are also in the works, in order to play “ASLSP” (As Slow as Possible), by John Cage. The song will be expected to play for 640 years, beating out the current attempt to play the song in Germany, which is only playing for 63 9 years. “ASLSP” is expected to start playing in 2019, terminating in 2659, where normal timekeeping operations will continue. In the meantime, students can enjoy Big Shaq, Metallica, and whoever wrote the “Curb Your Enthusiasm” theme song while they walk down the Spine. Scribe Comments Off on Out-of-state student numbers rise, UCCS recruits throughout U.S.